Spring is my favorite time of year. I love the warmer weather, gorgeous flowers, and the fact that Mother’s Day is Sunday, May 14th! It is just an all around fun time of year that prepares me for the summer fun that is right around the corner. Today I am sharing some DIY Mother’s Day gift Basket Filler Ideas just in case you were thinking about making one for your mom(s). Gift Baskets are one of my all time favorite things to receive. There is just so much joy when it comes to opening one up and discovering all the carefully curated goodies in it. We all know what our moms love, so picking up cheap beauty finds at places like CVS is a great place to start. 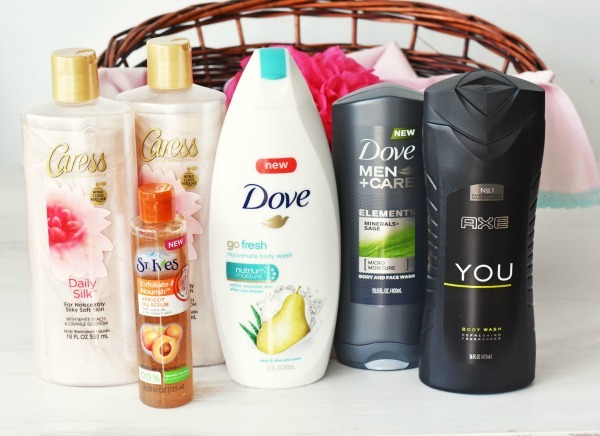 Right now, CVS is having some killer deals on Dove, Caress, Simple, and St. Ives products. Not only are these some of my favorite beauty brands, but they just so happen to be my mom’s too. I grew up watching her apply St. Ives lotion to her body and Dove was the soap we used religiously. My grandmother was a Caress Daily Silk kind of woman and used it for years! 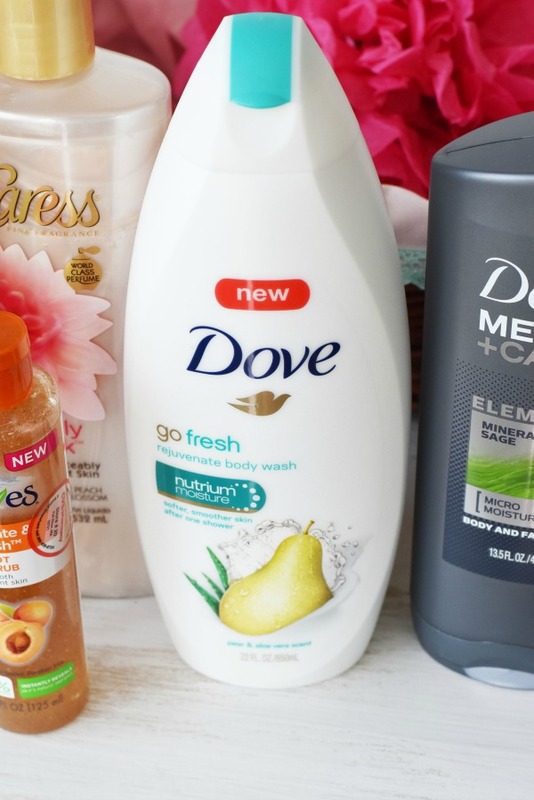 Dove Go Fresh Rejuvenate Body Wash, Caress Daily Silk Body Wash, and St. Ives Apricot Oil Scrub are all on sale starting now! 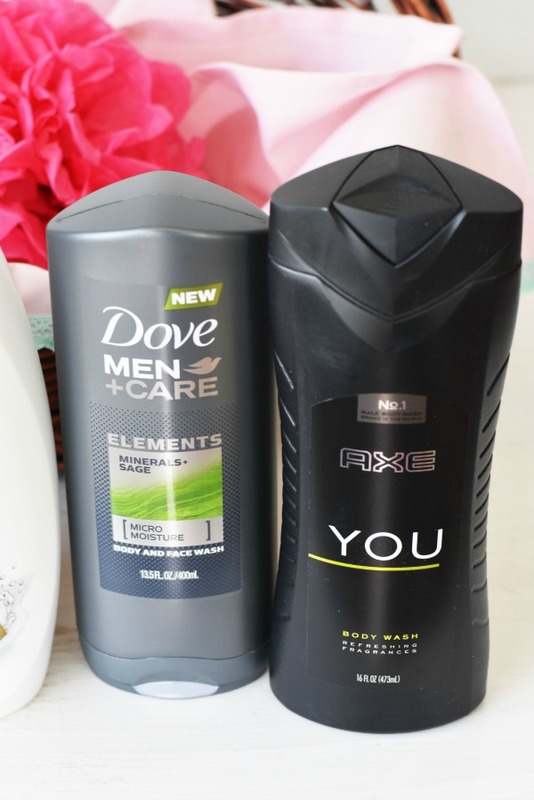 Buy One, Get One 50% Off Dove and Dove Men+Care Personal Washes, AXE Shower Gel, St. If I were you, I would check my coupon inserts, and head to CVS to get some stellar deals on these beauty brands. As you can see, AXE You Body Wash and Dove Men + Care Minerals + Sage Body Wash are also part of these deals. I bought a few products to get a head start on my Father’s Day gift basket for Jared. My gift basket also included a candle, ear buds for my mom’s gym time, note cards because she leaves a lot of notes at work, a lightweight fashion scarf, Simple wipes to remove her makeup, and lots of beauty products from CVS. I know there are literally so many gift basket filler ideas, but my theme is basically a spring pampering Mother’s Day gift basket. You could do a gardening one, foodie one, sewing one-the possibilities are endless! We also have a MEGA fun giveaway for you all! Enter below to win a $50 CVS gift card to get you on your way to being pampered this spring! Visit CVS.com/BeautyBeginsHere and while you are there, take the quiz to see which face care products you would like to try. ]]]]]know that CVS has become the drugstore that has everything so I know that you can make a great gift basket there. I hope my husband reads this to get his ideas about what a mom loves because he is usually bad at this. I.know I’ll need bug spray, sunscreen and aloe. These are all nice products, and I love putting together gift baskets. 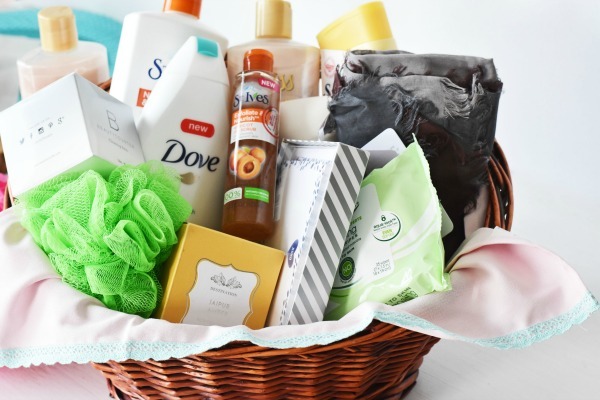 The basket should have Dove Nutritive Solutions Daily Moisture Shampoo, Dove Deep Moisture Body Wash and Caress Body Wash, and also St. Ives Facial Oil Scrub in Coconut!!! oh wow, better make two baskets, as I want one for me! Oh my goodness this is a great idea! I would love to spoil myself this Mother’s Day. Maybe I will keep this post up when my husband gets home so that he can see what I would like. Oh what a beautiful basket!!! I love a lot of these products. I used to use St Ives all of the time, I would love to try that new wash! I would love yo try the Dove Go Fresh body wash. This is such a great idea! I would love to receive a basket like this for Mother’s Day. What a great mothers day gift idea! Plus CVS has a great rewards program which makes it one of my favorite places to shop. What a pretty and practical gift basket, I would LOVE if my kids gave me that. I can imagine that the pear scent body wash would be so refreshing to shower with. 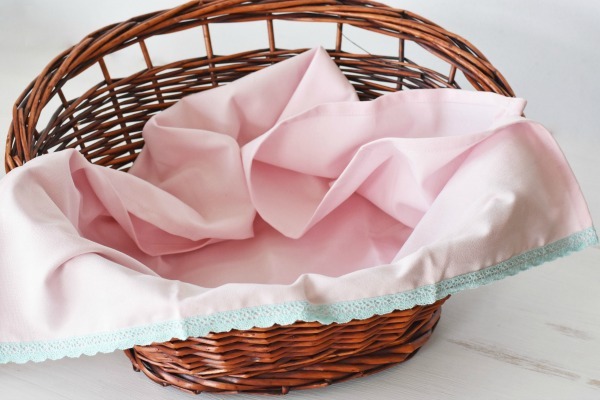 That’s a great DIY Mother’s Day basket! I might need to drop some hints to my kids that they could make one of these lol. These are such great ideas for us mamas! I am definitely sharing this with my hubby! I love to make up gift baskets. It is always fun to go shopping for the goodies to put inside. These are all great products. I love this idea for a gift basket. I may have to leave my computer open to this page as my husband or daughter walk by. I love St. Ives products so I’m definitely checking out that great deal! Thanks so much fir the idea for basket filler! I will definitely pick up the St Ives facial scrub, Dove body wash, and St Ives lotion. I will pick up Olay facial lotion with SPF, Coppertone sunscreen for days spent outdoors. Softsoap body wash and St. Ives body lotion. I would get Dove sensitive skin body wash. I am definitely going to buy the St. Ives apricot scrub – one of my favorite brands – have been using it for years. I plan to give some to my sister as a mother’s day gift. I will also treat myself to a nice body wash with a fresh scent. I would love to get some Korean skincare products like Frudia and Pig Nose mask because CVS started carrying them! I get my sunscreen there. I will put together a Spring cleaning basket for my mother. She always looks forward to this every year. I’ll be picking up sun lotion, bug spray, allergy pills, first aid items and nail polish. I like to get all my dental care needs met @ CVS. I get floss, those little things like toothpicks that go between the teeth, my pronamel toothpaste and the Crest 3D white for strengthening my teeth. I will buy my OGX shampoo, conditioner and spray. I will also buy my Revlon facial powder make-up. I would buy sunscreen and water. We go through so much during the summer. I will be picking up Schwarzkopf hair dye, shampoo, conditioner, and a spray oil. I have some coupons and there’s an extra care bucks deal on these products so I am super excited to shop at CVS for these items. I would choose the Dove body wash and St Ives Apricot Oil Scrub. I want to pick up and try the St. Ives Apricot Oil Scrub. 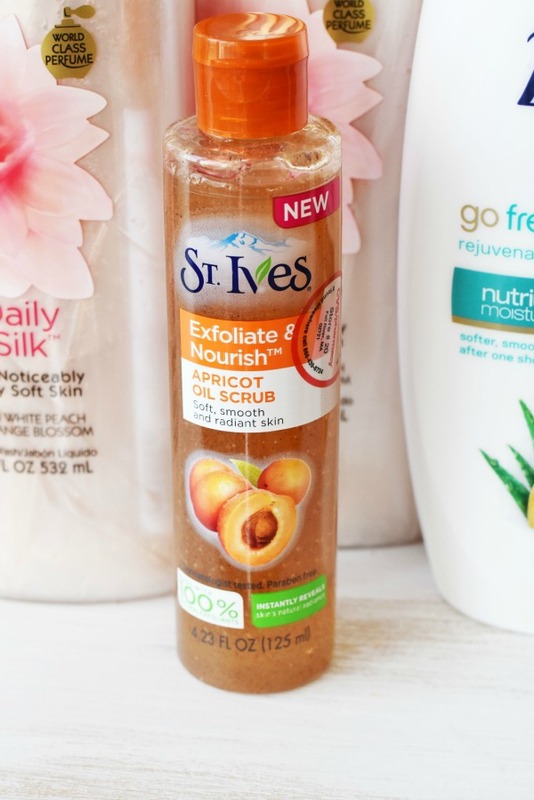 I would love to get and try the St Ives Apricot facial scrub. I will definitely be picking up my sunscreen at CVS this summer. I love the Doves body wash & the St. Ives scrub. They look like great products that I would definately pick up ! I love CVS for hair shampoo. They have great deals. I also like going there for my sunscreen. I’d get the Dove Sensitive Skin Body Wash. I also need to get more sunscreen. I would love to get the Apricot Oil Scrub at CVS! it sounds like a great way to help keep my skin clean and fresh for summer! I took the quiz and was recommened the POND’S Cold Cream Cleanser—perfect for me! I would love to get a basket of beauty and relaxing shower products for Mother’s Day. I like to get sunscreen there for these long sunny days! I need some new foundation, some hair dye, and some good sunscreen! I would grab some suntan lotion. I found myself getting burnt a couple weeks ago because I was outside for many hours. I would buy from CVS some new spring nail colors – especially gray which is going to be really hot! And some of the St Ives Exfoliating Body Wash.
Dove, dove & more dove products. I’ll be picking up both face wash and new sunblock for the warm days ahead. I’d get some anti-frizz stuff and some new eyeliner. I buy my shampoo,conditioner and body wash at cvs! I need vitamins and chocolate. CVS is g-r-e-a-t! What a fun basket! I might pick up some eyeliner at CVS this spring. i love suave body wash and head and shoulders shampoo. I would like to try the St. Ive’s Apricot Oil scrub. Looks invigorating. The Apricot Oil Scrub is a new product by St. Ive’s and something I NEED to try!! I will be picking up some suntan lotion for all those sunny summer days ahead. I would pick Dove products. I love the smell of Dove. This spring I’ll be picking up some new makeup at CVS for all the weddings I’ll be attending. I would love to try the body wash too. I would make my mom a gift basket with some of her favs. I would get some face masks. St. Ives scrub sounds really nice for my skin. I usually buy the products we use that have rewards back that I can combine with a coupon. We would get Pantene shampoo and conditioner for curly hair. We would also get Dove mousse for curly hair. I’m sure my girls could find some makeup to buy with the rest of the gift card. Thank you! This time of year I always need more moisterizer and sun block. Would like to get that apricot oil scrub and stock up on some make-up. Sunscreen, lip gloss, Mother’s Day and Father’s Day cards. I am going to pick up the Men+Care hair products! My husband loves them! I will be picking up Dove deodorant, dove shampoos and conditioners my family like all the Dove products. The St. Ives Apricot oil scrub you mentioned sound interesting and I think I will give it a try. The dove go fresh will be great for the season! Thanks so much for the chances to win. I will pick up some Dove shampoo and conditioner. sunscreen, deodorants, nail polishes and some cards. I will be picking up bath products at CVS for Mother’s Day. I would pick up the Apricot Oil Scrub at CVS. the dove body wash looks nice. I will be getting some sunscreen. I’ll pick up Caress Daily Silk Body Wash and St. Ives Apricot Oil Scrub. I would love to make a basket for my mother with her favorite anti-aging products. I already buy everything from CVS, and have been doing it for years. When I get off from work, I’m tired, and I don’t want to have to fight the crowd at Walmart. So I duck into CVS and get what I need…..makeup, hair products, tissue, cough drops, almost anything I need or want, they got it. Thank you for the giveaway. I’d love to pick up some pampering bath and body products! I’d also purchase sunscreen, lip balm, and something for our allergies. I love St. Ives so the body scrub is on my list along with aloe vera burn gel, sunscreen and beach supplies like sunglasses, hats, etc. We will definitely be needing some new sunscreen as the weather warms up! 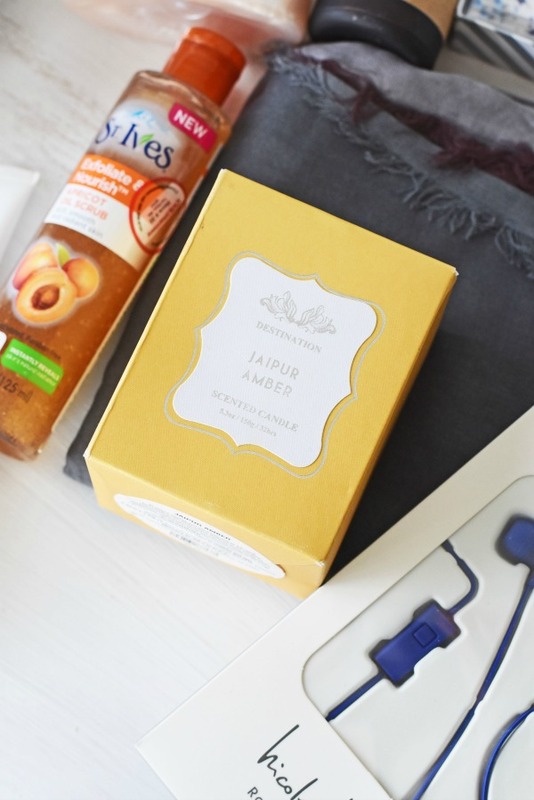 The new St Ives apricot face scrub is the first thing I’d like to try! I will pick up the Dove Nutritive Solutions Daily Moisture Shampoo and Caress Body Wash. I have a CVS near my house and I go there quite often. With the warmer weather I will be picking up sunscreen and bug spray. I love the St Ivys scrub! And the dove products! Thanks for this awesome chance! I’m waiting just a while longer to buy the Eos grapefruit lip balm with spf. 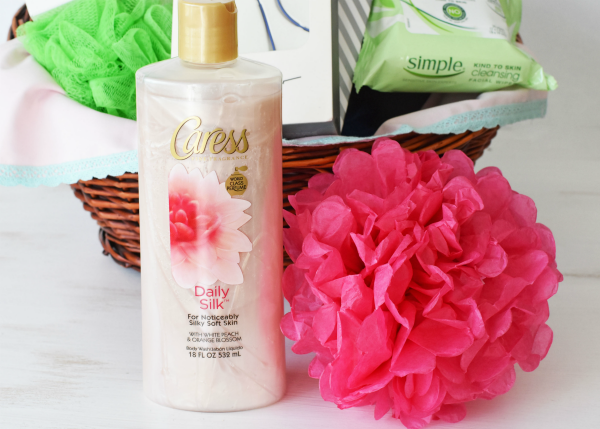 I would pick Dove sensitive skin body wash.
Caress Daily Silk sounds so luxurious for your skin. I definitely have to try this product. this is a great mothers day gift! i would pick up some apricot scrub and dove body wash at cvs, and epsom salts too! The St. Ives Apricot Oil Scrub looks perfect for spring! I will be picking up body wash, bar soap and sunscreen this spring from CVS. I’ve been using the St Ives apricot scrub for as long as I can remember so I would love to try the Apricot Oil Scrub. I haven’t seen it in my local CVS yet but I’ll keep an eye out. I would get the Dove body wash. This is such an awesome idea and I would love to do this for my mother n law. 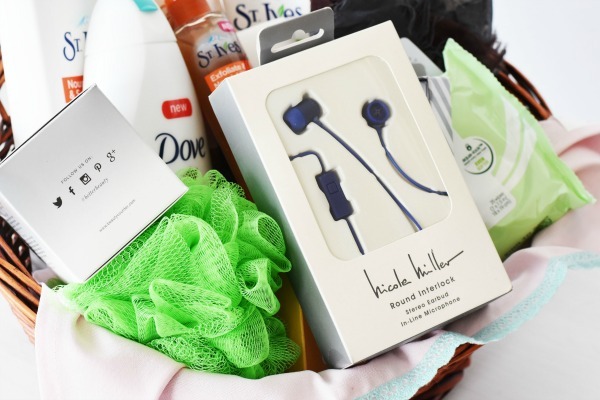 I love all products from St. Ives to Dove and everything in between….add some candy and maybe a CD of her favorite music and this would an awesome present. I love the idea….thank you so much for sharing. So nice, and OMG as I’m sitting here typing this I just remembered I have the perfect basket. YOU ROCK! We would definitely pick up some CVS allergy meds (OTC) this Spring !!! I would pick up body wash, lotion, and sunscreen. I’d probably get the St Ives apricot scrub for myself, and for my mom some chocolates and some of the Dove Body wash. Oh, and a scented candle of some kind, she loves those. I need to obtain some sunscreen and other skin care items next time I go to my local CVS store. Dove Sensitive Skin Body Wash is the only soap I can use on my lousy dry skin, so I’ll definitely pick up several bottles. They have a lot of goodies. I would pickup some diet pepsis first thing. Then some Munchos potato crisps, fig newton cookies, pretzels,chips ahoy and some other good stuff to snack on. 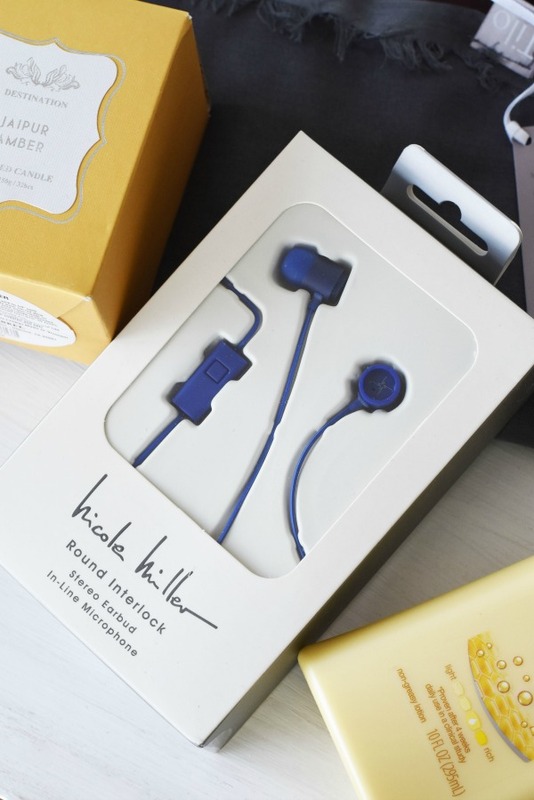 What an awesome list of great gift ideas! Thanks for sharing. I’d definitely be picking up the Dove products from CVS. We have been Dove fans for a long time now! The Caress! Cvs is my favorite place to coupon and $50 would go a lonnng way! would love to try all the dove products. I am in love with all these products !!! thanks for the giveaway! I would pick up snacks and allergy meds. 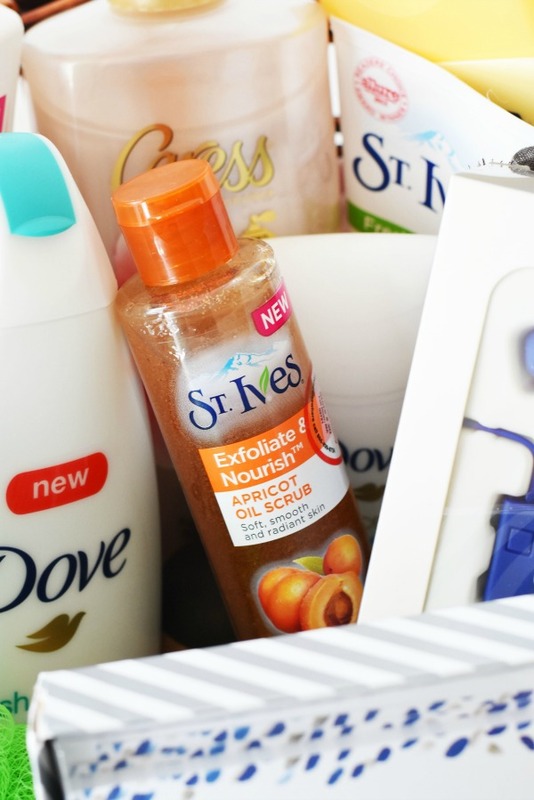 I would pick up the Dove body wash.
i love st Ives facial washes they are amazing and Dove products rule all of them my bathroom is full of them! I like CVS for shampoo and conditioner because i can always find a great deal.